Saturday June 13th the guitar legend brought his new cartel back to Dayton for another career go around. With songs spanning his time barking at the moon and committing the ultimate sin with Ozzy. He also journeyed to the badlands and played a few choice cuts from his recent release with Red Dragon Cartel. He’s played and toured with Ozzy and lived to tell about it. Lee had a stint in Ratt’s early days along with Dio, Holy Diver era, and was selected as Ozzy’s permanent guitarist following the death of Randy Rhoads. Lee recorded Bark at the Moon and The Ultimate Sin touring on both before being unceremoniously fired by Sharon Osbourne. Lee then formed Badlands in 1988, releasing two records and a non-US live studio demo CD. He’s appeared and played on various records since. 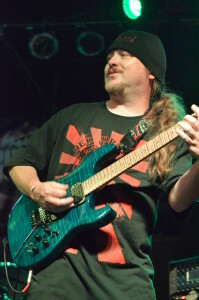 Dayton offered up the educated/experienced guitar prowess of the Alfie Luckey band and 80’s metal enthusiasts 80 Proof. With a definitive feeling of community and shared love of metal in the air, the talent tour up the stage. Leaving only eardrums damaged but eyes impressed. Inspired by his father, starting the guitar at the early 80’s age of 13 Luckey played by ear till he was 19. His father was his mentor and the reason he plays today striving to improve daily. His mother and grandfather helped him achieve his dream sending him to Sinclair earning an associate’s degree in classical guitar/music and graduating from the Guitar Institute of Technology in Hollywood, CA. He continues to play honoring their memories and support they bestowed. He now instructs and teaches while playing in different bands. He also had the opportunity to meet legendary guitarist Jason Becker at the Not Dead Yet 3 festival in San Francisco. He got to hang out with him the next day at his house and play for him on his signature numbers guitar. Bassist Todd Bowman who has an odd resemblance to Steve Perry started his journey at Sinclair studying music education. He’s cut his teeth in Fighting the World, Downcycle and Firstborn. 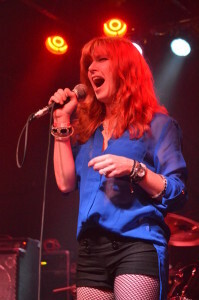 The show began featuring the fire-red eyed femme fatale Kristine Scream on vocals and Andy Hall on drums. They opened with the adrenaline laced “Superhero” as Scream poured her leather stretched and strong lungs into the mic. Scream, a professional dancer and theatrical performer has 12 years in the biz, starting with Once Upon a Tragedy then Spires of Altum out of Richmond. She’s appeared with the Darin Moore maelstrom and currently sings in Avareous. With an upcoming solo single and forthcoming website she’s ready to bring the scream to the masses and took the stage to demonstrate. 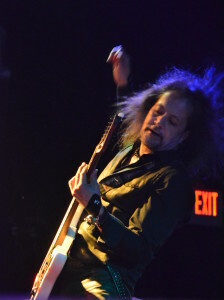 Jake E Lee Brings the Red Dragon Cartel Back to Dayton – Covering the Scene.